It really is too hot to think about food at the moment. I know we’ve not had much of a summer yet, but I don’t take too well to the heat; now it’s arrived all I want to do is lie in a hammock under a shady tree and drink iced tea – peach and rhubarb iced tea to be exact. When I say I want to drink iced tea, that is precisely what I mean. In a disappointing reality check, it’s currently so hot that the ice melts before I can pour a glass and get it to my lips, let alone take photos of it. Luckily, this iced tea is a super refreshing drink even if it’s not as chilly as I’d like it to be. I thought I’d make some signature thyme ice cubes this year. Don’t worry, I won’t be making any of the tin version. As soon as my thyme started to flower, I was out snipping of its heads and embedding them in ice cube trays. They make a great addition to summer drinks, contributing an extra subtle layer of flavour and a pretty flower to boot. A few of these went into the iced tea. Last week I attended a Fairtrade Foundation Press Day. I’ll be posting about this shortly, but meanwhile I wanted to rave about the peach & rhubarb tea that I tried whilst there. I’m not really a fan of fruit teas, but I was so intrigued by the flavours that I gave it a go. I was assured that the ingredients are all entirely natural and indeed it tastes of real peaches with a little hint of tart rhubarb. I was smitten. The tea comes from The London Tea Company in case you’re wondering. To call this a recipe is a bit of an overstatement, it’s more of an idea really. The peach & rhubarb tea base is enhanced with sliced peaches and given added depth with strawberries, mint, lime and thyme flower ice cubes. You could always add a glug of rhubarb liqueur to liven things up a bit. Just saying. If peach and rhubarb doesn’t grab you as a flavour, you can use any sort of tea you like, black, green, fruit or herb. Rooibos is a firm favourite with us. If you like the idea, why not pin the above photo to Pinterest to remind you. 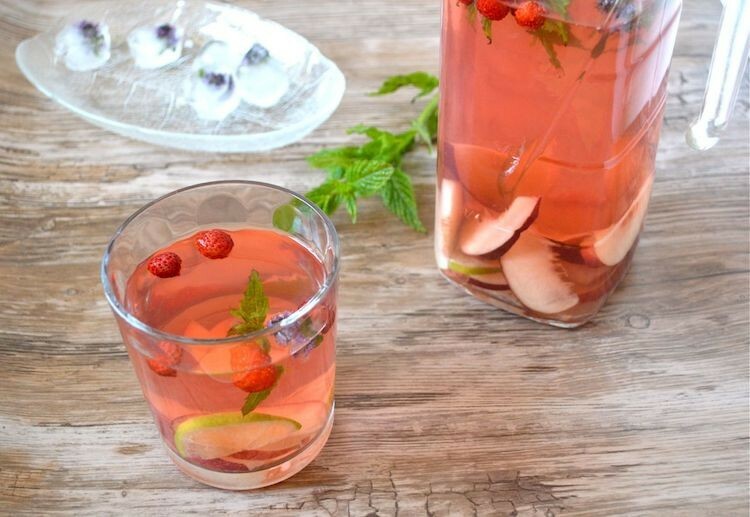 A refreshing fruity tea best served chilled whilst lazing in a hammock under a shady tree. Boil half the water and pour over the teabags. Cover and allow to steep for 5 minutes. Remove the teabags and add the remaining water - the colder the better. Allow to cool. Place the fruit and mint into a large jug, pour in the tea and give a good stir. Add the ice cubes, pour into glasses and sip away. Cooling the tea can take some time, but if you have room in the fridge, it will cool a lot faster. Use whatever tea you like and add fruit or herbs as appropriate. Lemon is always a good bet. If you like your drinks sweet, you can add a little sugar or sweetener of your choice to taste. The peach slices and strawberries, however is enough for me. You can always add a little rhubarb liqueur to liven things up a bit. How pretty! They are indeed a perfect summer cooler. Thanks Angie. We’re going through loads of it today. It’s been our hottest day this year. Those ice cubes are so pretty! I also love the colour of your iced tea – it looks delicious! Thanks Emma. Thankfully, it’s a little cooler here today, but I think I might need a glass or two anyway. Peach and rhubarb what a wonderful combination! Sounds very refreshing for these hot days! I love that you didn’t sweeten this, I’m sure that with those fruits it’s more than sweet enough naturally! It looks so refreshing and sounds delicious! Thanks Lisa. I’m not really fond of sweet drinks. I eat plenty of sweet stuff and don’t really want to drink it too. Thanks Alida. I know what you mean, I find it hard to do any work when it’s so hot and humid. Luckily it’s a lot cooler here today. It’s so hard to think of you being cold in Australia Johanna. We’ve just had a mini heat wave and all I want are thirst quenching cold drinks – not my normal default. How pretty is this? What a lovely summer drink. I loved iced tea anyway so the strawberries and peaches in this sound delicious. Iced tes is definitely a perfect refresher on a hot day. I am a huge fan of fruit teas (although I am quite picky about which ones I drink)….. sadly, Rooibos gives me eczema! The ice cubes are beautiful….. but tin would be a bad idea , I agree! Hahaha, I’m glad you agree with me on tin! How horrid and strange that rooibos should give you eczema. It seems such an inoffensive drink.